Nicotiana is a great plant to grow with your veg or on its own. 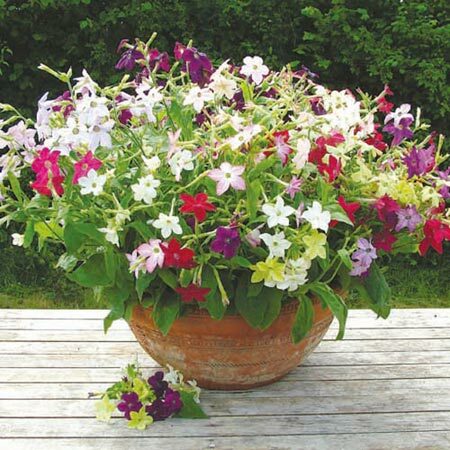 This mix produces compact plants with sweet, almost jasmine-like scented flowers. The lovely little flowers include, amongst others, green and purple, a real eye catching combination in the garden and in the home. Try planting them by doors and under windows, then as the summer sun warms your garden, you’ll get the alluring smell of these plants, wafting throughout your home. Height 60-75cm (2-2½’). HHA - Half-hardy annual. Ideal for beds and borders, patio pots and containers. Drought resistant. Prefers full sun. Water regularly for taller, more vigorous plants.